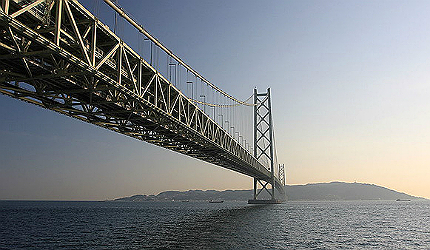 Akashi Kaikyo Bridge was built over the 1,500m Akashi Strait. Image courtesy of Kim Rötzel. The suspension bridge connects Kobe to Iwaya. Image courtesy of Glabb. The Akashi Kaikyo bridge has two pylons, each with a height of 282.8m. Image courtesy of hideto onodera. The length of Akashi Kaikyo Bridge is 3,911m. Image courtesy of Mti. The Akashi Kaikyo Bridge can withstand strong typhoons and earthquakes. Image courtesy of Hideyuki KAMON. The bridge can expand up to two metres (seven feet) due to heat in day time. Akashi Kaikyo is 3.9km long bridge built across the Akashi Strait, a 1,500m international shipping canal that connects the Pacific Ocean to the Sea of Japan. "Seismic design features of the bridge are quite different and unique when compared to bridges constructed in the past." The suspension bridge connects the city of Kobe (mainland of Honshu) to Iwaya (Awaji Island) in Japan. The spectacular view of the bridge in the night resulted it the name, Pearl Bridge. The bridge was opened to traffic on 5 April 1998. It forms part of the Honshu-Shikoku Highway. The original design of the bridge was prepared for both cars and trains. Later, the final design was approved only for the road way. The bridge carried nearly 23,000 cars each day. Research had revealed the need for implementing new technology and maintenance techniques for proper management and maintenance of the bridge. Dry air injection system was one of the technologies used, which was used to maintain the bridge. The bridge was designed to resist strong typhoons of 180mph and earthquakes up to magnitudes of 8.5 on the Richter scale. "The suspension bridge connects the city of Kobe (mainland of Honshu) to Iwaya (Awaji Island) in Japan." It has six lanes of roadway, three in each direction. It consists of three spans. The length of the central span is 1,991m, currently the longest span for a suspension bridge. The end spans are 960m long each. The truss width is 35m. The bridge is located at a height of 280m from the sea level. The two strong girder systems enable the structure of the bridge to withstand against typhoons, earthquakes and harsh sea currents. The height of each supporting pylon is 282.8m (928ft). In a day, the bridge can expand up to two metres (seven feet) due to heat. The foundation of the tower-pier was designed as such that it can transmit 181,400mt of vertical force to the rock layer, which is about 60m below the surface of the water. The bridge employs pendulums, which operate at the resonance frequency of the bridge to dampen forces. Construction of the bridge began in May 1988 and took nearly ten years to complete. The foundation depth of the bridge is equivalent to that of a 20-storey apartment. Nearly 181,000t of steel and 1.4 million cubic metres of concrete were used in the construction of the bridge. Underwater non-disintegration concrete was developed for the bridge’s construction for better fluidity and consistency. More than 100 contractors were involved in the construction of the bridge. The main contractor was Honshu Shikoku Bridge Authority. The total cost incurred for the bridge completion was $4.3bn. The cost was endured by the Honshu Shikoku Bridge Authority, the main contractor of the bridge. The high cost of construction was due to the seismic design elements that had to be incorporated considering the seismic activity in the region. Tokyo Gate Bridge, also called the Dinosaur Bridge (derived from its shape), is a 2.6km-long truss bridge over Tokyo Bay in Japan. Seismic design features of the bridge are quite different and unique when compared to bridges constructed in the past. The substructure is extremely large. The layer of the granite rock is at a huge depth at the point of construction. The top of the granite was covered with a thick soft rock layer of the geological era. Finite Element Method (FEM) was used to check the seismic stability of the foundations. Each foundation carried a common seismic input. Seismic input was an envelope of two acceleration response spectra at the surface of the ground.